Play, Dance, Cheer, Sing on the court! Have your school or organization’s choir sing the National Anthem before a game. Youth Basketball teams can play a game or your organization can perform, cheer, sing or dance during halftime of a game. Earn money for your team or organization by utilizing tickets to the Motor City Madness tournament. CLICK HERE TO SIGN UP FOR AN EXPERIENCE. Trivia Nights | Monday, February 19 at 6:30 p.m. Think you and your team are the smartest in Detroit? Put your knowledge to the test during Little Caesars Arena Trivia Nights at Sports & Social Detroit. Registration includes one all-day ticket for any Horizon League Championship session and a chance to win signed Red Wings memorabilia. Don't miss the first-ever Motor City Madness Esports Championship at Little Caesars Arena. The tournament features 16 NBA 2K18 qualifying tournaments from Feb. 20-25, along with a live championship event at Little Caesars Arena on the eve of Motor City Madness for a chance to win your share of the $10,000 purse! Yoga Day | Thursday, March 1 at 8 p.m.
Be part of the first Yoga event on the Horizon League Basketball Court at Little Caesars Arena! Registration includes entry to the yoga session led by certified yoga instructor Courtney Welch, four tickets to all Horizon League Championship games on Saturday, March 4, a Namaste in Detroit Tank Top and more! Senior Skip Day | Friday, March 2 at 10 a.m. Spend your senior skip day at Little Caesars Arena and enjoy Motor City Madness action and a private arena tour! Registration includes a behind-the-scenes tour of Little Caesars Arena, a Lower Bowl General Admission ticket for all Horizon League Championship games on March 2, a limited-edition Little Caesars Arena mug and more! Faith & Family Day | Saturday, March 3 at 10 a.m.
Join us on Faith and Family Day at Little Caesars Arena! 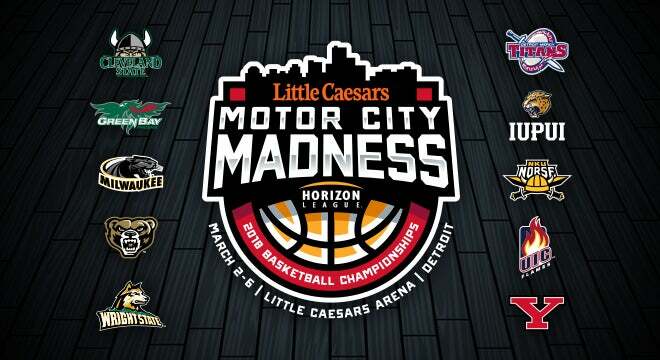 Registration includes a private tour of Little Caesars Arena, one ticket for all Horizon League Championship games on March 3 and a pregame meet and greet with Red Wings team chaplain Tom Fraser. Painting Night | Saturday, March 3 at 6 p.m. Create your own "Spirit of Detroit" painting at Little Caesars Arena during the Horizon League Basketball Championships. Registration includes a painting class taught by the Lush Brush, a ticket to all Horizon League Championship games on March 3 and exciting prize giveaways during class! Youth Basketball Camp | Sunday, March 4 at 8:30 a.m. Youth basketball players aged 8-14 are invited to join us for the 2nd Annual Motor City Madness Basketball Camp on Sunday, March 4. Don't miss the chance for your child to play on the court at the brand-new Little Caesars Arena and learn the key skills to be successful on and off the court from former college players. Registration includes a ticket to all Horizon League Championship games on March 4 and a limited-edition Motor City Madness basketball camp t-shirt. Baby Race | Sunday, March 4 at 5 p.m. Think your baby has what it takes? Come found out at our first Baby Race at Little Caesars Arena! Registration includes one ticket to all Horizon League Championship games on March 4 and a special prize for the winner. Champions Brunch | Tuesday, March 6 at 10 a.m.
Join Detroit Pistons legends for the second annual Champions Brunch at Little Caesars Arena on Tuesday, March 6. Registration includes brunch in the Rehmann Club with panelists including Earl Cureton, James “Buddha” Edwards and Rick Mahorn, as well as a ticket to the Motor City Madness men's and women's championship games.